Abstract: On Sunday, 25 August, 1918, two Curtiss HS-2L flying boats of the United States Navy took off from United States Naval Air Station Halifax, located at Baker Point on the eastern shore of the harbor. They then proceeded to fly over the Citadel – thereby eliciting a strong letter of protest from the army authorities. From this somewhat inauspicious beginning commenced 100 years of aviation at ‘an East Coast Air Station’ – and what an exciting 100 years they have been. The air station played an integral part of the development of the RCAF in the lean years of the Depression and during the Second World War, was the main operational base of the RCAF’s Eastern Air Command. After the war, the station was transferred to the Royal Canadian Navy and renamed RCN Air Station (RCNAS) Dartmouth and commissioned as HMCS SHEARWATER. With the unification of the Canadian Armed Forces in 1968, HMCS SHEARWATER became Canadian Forces Base Shearwater and reported first to Maritime Command and then, in 1975, to Air Command. Today, Shearwater is the Master Helicopter Base of the RCAF responsible for the provision of operationally-ready maritime helicopters and personnel to the RCN. 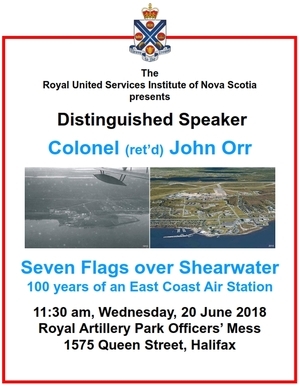 This talk will trace the 100 years of aviation at Shearwater and seek to explain the historical significance of the events that took place there.